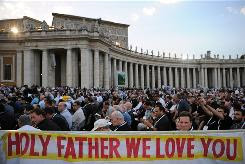 At a vigil service last night, Pope Benedict addressed priests from around the world An estimated 15,000 priests have come to Rome to observe the conclusion of the Year of the Priest and to show their support and admiration for the Holy Father. “Your rod and your staff – they comfort me”: the shepherd needs the rod as protection against savage beasts ready to pounce on the flock; against robbers looking for prey. Along with the rod there is the staff which gives support and helps to make difficult crossings. Both of these are likewise part of the Church’s ministry, of the priest’s ministry. The Church too must use the shepherd’s rod, the rod with which he protects the faith against those who falsify it, against currents which lead the flock astray. The use of the rod can actually be a service of love. Today we can see that it has nothing to do with love when conduct unworthy of the priestly life is tolerated. Nor does it have to do with love if heresy is allowed to spread and the faith twisted and chipped away, as if it were something that we ourselves had invented. As if it were no longer God’s gift, the precious pearl which we cannot let be taken from us. Even so, the rod must always become once again the shepherd’s staff – a staff which helps men and women to tread difficult paths and to follow the Lord." May God bless, protect and encourage our priests .